When Greg Demmert, partner of Demmert and Associates decorative concrete contractors in Glendale, Calif., got the call from an architect he frequently works with regarding the renovation of the 7 For All Mankind offices in Vernon, Calif., he jumped at the opportunity to bring his skills to the table. Forward-thinkers at the company 7 For All Mankind LLC, which was the first denim brand to launch the premium denim category into the U.S. contemporary market, recognized the talents of Demmert and Associates right away. And just as 7 For All Mankind's premium jeans literally exploded onto the scene, quickly earning critical acclaim, so too has the popularity of decorative concrete. 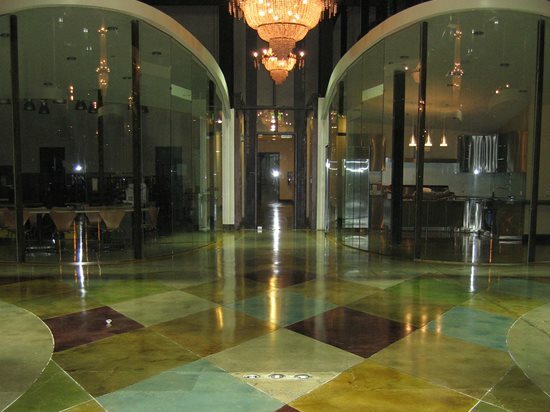 Demmert and Associates, which specializes in polishing concrete to a lustrous, glass-like finish, also stains and overlays concrete, in the process serving up beautiful decorative concrete to Los Angeles and Ventura counties. For a decorative concrete contractor and a jeans maker, it was a match made in heaven. "It started to take shape as it went along," recalls Demmert of the project, for which he dealt with existing concrete floors. 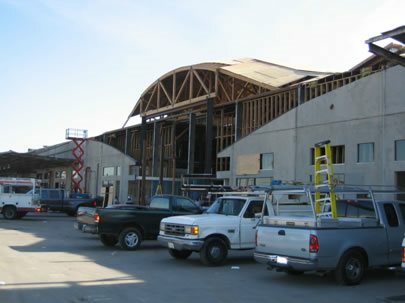 The building, a regular tilt-up construction warehouse, was to be renovated from top to bottom. The incredible plans included taking off the roof and bringing in trusses, creating a glass front to the building, and much more. Demmert first created a few samples for the architect to peruse. "Before we started, we came in and ground a section and put down every color Smith offered, as well as a section of acid stain and a integrally colored micro topping," adds Demmert, who says that because the plans were vague and he wasn't exactly sure what they wanted, he ended up doing six or seven rounds of samples, showing them to the architect, the designer (who is also the architect's wife) and the owner of 7. "Then one day I saw the architect in the parking lot and he said, 'You're gonna hate me!' He showed me the plans, and there were so many linear feet of saw cuts it was crazy," Demmert laughs. He ended up doing diamond patterns throughout the building, with each side 55 inches, each diamond a different color, and each color a different dilution of that color. "The first diamond area that we stained was about 300 square feet and it took two days," he adds. "We taped each individual area off and shot each color into the diamonds and then had to wait for it to dry. We quickly realized that this was not going to fly and started thinking about a more efficient way to stain the floor." After a quick "research" trip to Home Depot, Demmert says he found the solution. "I got four quarter-inch aluminum pieces of angle iron, a roll of duct tape and four really big pieces of cardboard," he explains. "Then we were able to slide the angle iron into the saw cut with the cardboard taped to it and have a far more efficient 'masking system'). There was also a fair amount of trenching for electrical boxes and some plumbing. I think that's part of the reason that they chose the argyle-esque pattern, to break up the linear cuts that crossed the floor." 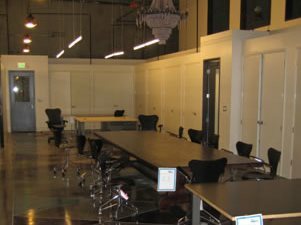 Not only were there design issues, but there were also limitations because Demmert was dealing with a 40-year-old concrete warehouse floor. "The architect liked the flaws in the concrete," adds Demmert. "He didn't want us to do overlays because that made [the floor] look too perfect." 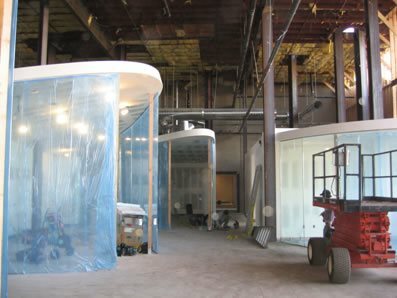 Starting in October 2005, the renovations were completed in April 2006. Demmert says the initial grind and edging was completed in the first month, and all told, his work, for which he used a four-man crew, took a couple of months to complete. Because the roof trusses were being installed and the existing roof was being removed after the floors were in place (due to weather constraints), Demmert says there were an unusually large number of scissor lifts on the job. "We were constantly having to fight for space with everyone else trying to do their job," he adds. "It was a large construction job and we had to redo some stuff based on that," Demmert notes. "People would come in behind us and drag heavy equipment across the floor." Relying on GST International sealer (high-gloss wet-look lacquer and final coat over the top), Demmert says the product withstood most of the abuse. "They drove a scissor lift across the floor at the end when it was completely done, and it's a true test of the sealer that it held up so well," he observes. Among the other products Demmert relied on is Smith concrete stain, a versatile product that can be diluted anywhere from 4 to 1 up to 8 to 1 to control the color intensity. "I made the mistake letting [the architect] know that, because then that's exactly what he wanted," he laughs. The majority of the floor was from Smith's new transparent series, which Demmert says yielded the look of acid stain "without all the headaches that come with the acid-based products." The main part of the floor was done in Smith's Fawn 8 to 1 dilution. 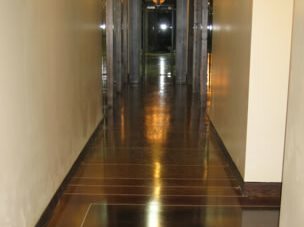 As the color made its way through the hallways and approached a doorway, there were saw cuts put into the floor (two that were two feet apart, then two that one foot apart, and a rectangle in the middle) and then the cuts reversed themselves. The Fawn stain dilution went from 8 to 1, 7 to 1, 6 to 1, 5 to 1 and 4 to 1, with the center rectangle a 4 to 1 dilution of Nutmeg. Demmert says the work is the most custom job he's ever had a hand in. "I've done a lot of staining, but this is as custom as it gets," he adds. "It has a little bit of everything...I've taken some clients through and got some nice size jobs from it." Whether it's renovating warehouses into spectacular showrooms for Hollywood's favorite jeans, or renovating a customer's kitchen into a culinary sanctuary, Demmert and Associates always has an eye toward customer service and creativity. And the mix yields beautiful, durable and inspirational work.